The dead of summer can be a tough time of year to catch fish consistently. Although they are set up in their traditional haunts, there are times that they seem to disappear or quite biting altogether. Fish at this time of year tend to fill up quickly when they feed. The young of the year are big enough to provide a meal and there are plenty of them. The predator prey relationship is in full swing – there are hungry predators heavily feeding trying to put on weight to get them through the rigors of next winter and the consequent spawn. There are also literally tons of prey fish which makes for easy pickings and full bellies for predators. How does this affect us as we attempt to spend a full day on the water? It’s quite simple … these fish take very little time to feed and spend the rest of their time lounging and dodging larger predators. This is best done in the depths, the weeds, or on wide open flats. The reality of the situation is that you are trying to catch fish throughout an entire day while they are only actively feeding during short very intense periods. Open up your bag of tricks and get creative. Fish can still be caught. Here are some tips and tricks to get you through the summer. Speed up when things slow down. Summer is notorious for the bite to go on and off – frenzied for a while and then dead boring. When the bite goes off or fish have moved, most anglers will fall back to vertically jigging, slow live bait rig combinations, and slip bobbers The problem with slow precise presentations is that it ignores most neutral or negative fish that are not actively hunting for food and it limits your lure’s exposure to fewer fish. If slow isn’t working for you … speed things up. On those calm, sunny days when heavy feeding is limited to brief periods and where walleye and pike are said to have quit feeding, try fast trolling bottom bouncers and spinners tipped with worms, leeches, minnows or Berkley Power Baits. I use a heavy Shimano V-Rod and a Calcutta reel for this. Don’t hesitate to use big blades to get a fishes attention. Travel as fast as you can while maintaining contact with the bottom – you may need up to 3 ounce bottom bouncers to accomplish this. 4 to 6 kilometers an hour is not outrageous. The concept speeds your bait past as many fish as possible. You will find hungry fish or at least trigger neutral fish into striking. Sharpen your hooks. Sounds simple enough. You probably sharpened them last month… or maybe not. I keep a hook hone on the dash of my boat or in my pocket at all times. Every few fish, I sharpen the hook it only takes a second. Your hooks become dull from bumping into rocks and teeth. Hooks need to be sticky sharp to penetrate the toothy and boney mouths of larger fish. You don’t want to miss a fish due to a hook sliding and not sticking. If you don’t like to sharpen hooks, spend the money on some good lazer sharpened hooks. Anything with a cutting point is ideal. As the hook begins to penetrate, the resistance actually decreases as the three edges cut their way through for an instant, positive hookset. Stay on fish once you find them. Once you have found a school of active fish stay on them. Many a time I see anglers trolling a shoreline from end to end. 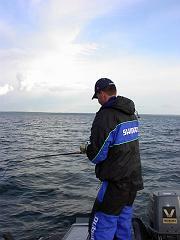 Each time they connect with a fish, they keep on trolling in the same direction until the pass is complete and then turn to go back and do it again. Upon catching fish on a troll I always do a tight turn and head back through the area I just hooked a fish in. I know there are fish there. Why would I ignore that? If the area is small, I may switch techniques to accommodate a more productive technique. Sometimes the school you were successfully fishing over has moved either up or down the water column or along it at the same depth. I keep in touch with these fish by staying in tune with where I caught my last fish and sliding along with them. Use thin wire leaders. If you are like me, you would rather lose the odd crankbait or jig than risk missing fish by way of a bulky leader. Those days are gone. There are now very thin leaders available that offer strength without overly large diameters. Examples would be Berkley’s Fireline leaders or any of the many titanium leaders on the market. No more lost fish to frayed leaders or gear to sharp toothed pike. If you are a tournament angler, this stuff will give you an edge. Keep a spare rod tip and a bit of glue with you. Newer rods can be fairly brittle. Don’t let them smack the side of your boat. They will develop tiny stress cracks that will cause you grief later. If you break a rod tip on any fishing trip, it could ruin your day or even week if you are on a longer trip. It will happen eventually. For a couple of bucks, you can save the day. Cut the broken tip clean and glue a new one on. Chances are the rod will be a bit stiffer and will offer greater bottom feel. You should only miss a few minutes of fishing All the best tips and techniques in the world won’t save you without a rod. A couple of bucks spent here will definitely save the day.